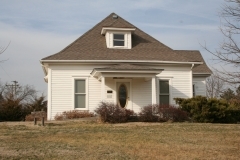 The Nincehelser House in Oskaloosa was begun in 1881. William Jefferson Nincehelser purchased the property in January 1886. Over the years of Nincehelser ownership, the house was expanded several times. It remained in the family until 1980 when it was relocated to Old Jefferson Town. Nincehelser was a successful local businessman who specialized in freighting. The Nincehelser House is nominated for its local significance as a good example of late 19th century Folk Victorian architecture. 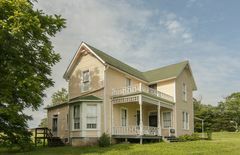 Its period of significance, 1881 to 1927, includes the years the house was constructed through the years it was altered. 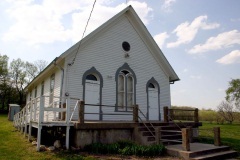 Sunnyside School is located on a rural one-acre parcel in Sarcoxie Township in the southern part of Jefferson County. The wood-frame building features a rectangular form and a front-gable roof and has a rather elaborate front elevation with two entrances flanking a set of round-arch windows. Built in about 1879, the school is patterned after a design by early Kansas architects John Haskell and Louis M. H. Wood that was published in the Second Biennial Report of the Kansas Department of Public Instruction. At least one other extant school mimics this same design - the White Chapel School in Pottawatomie County. The building was nominated as part of the "Historic Public Schools of Kansas" multiple property listing for its association with local education and its architecture. 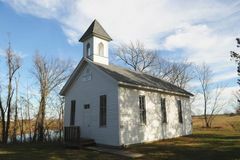 Summary: The Wellman Schoolhouse served the students of District #79 in Jefferson County’s Sarcoxie Township from the time of its construction in 1887, on land owned by stockman Harrison Wellman, until 1951 when the school closed. 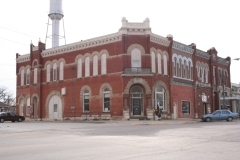 In 1970 the building was relocated to Old Jefferson Town to be part of the building collection established in Oskaloosa to showcase the built history of the county.